With its low housing prices, growing population, and pro-business environment, Nashville is becoming the place to own a business. As proud Nashville business owners ourselves, we at Tim Leeper Roofing take pride in being a part of this community, and we are always looking for ways to give back. One key way we do this is through offering the area superb roofing services. Not only do we inspect, repair, and replace residential roofs, but we also specialize in commercial roofing repair and replacement. 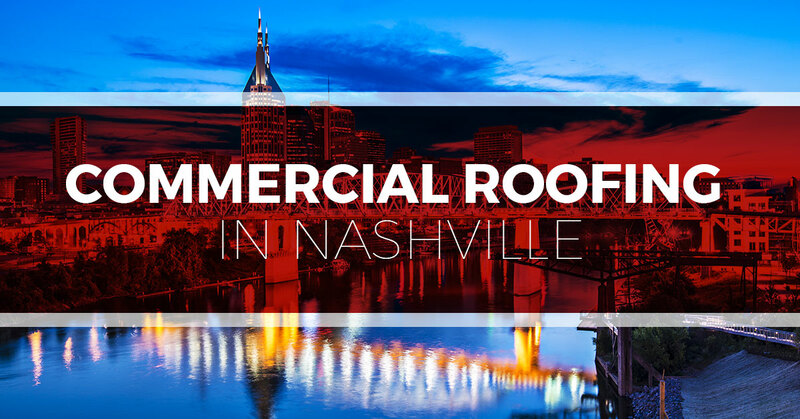 If the roof of your business or commercial space is in need of service, contact Nashville’s Top Rated Local Roofers. Read on to learn more about commercial roofing! Typically, commercial property roofs boast a longer lifespan and higher durability than their residential counterparts. However, they are not immune to damage and occasionally necessitate some work. Deciding whether your roof needs to be replaced or simply repaired can be a tough and difficult decision. There are many factors to take into consideration: the cost, the material, the expected lifespan, and the general condition of your roof as a whole. This is why it is important to hire local roofing contractors you can trust—professionals who have your interest in mind. At Tim Leeper Roofing, we will always suggest the option that makes the most sense for you and your budget. The first step in determining the most cost-effective course of action is to get your roof thoroughly inspected by a professional roofing contractor who can assess with confidence and experience. Tim Leeper Roofing can do just that, as well as lay out all of your options, consider your budget, field your questions, and do all we can to tailor our roofing services to fit your needs. If you spot any of the above signs, contact Tim Leeper Roofing today to schedule an inspection. The Roof Membrane Is Damaged – If over 25% of your roof membrane has been uplifted or is even bald, then it likely needs to be replaced. When these issues are not resolved, they can lead to serious damage to the roofing, attic, interior, and the overall integrity of the structure. The Roof Deck is Worn – Similar to the roof membrane, if your roof deck has a significant amount of wear and tear, it may be past the point of repair and require a full replacement. The Interior is Water Damaged – If the interior of your commercial property is riddled with water spots and stains, it may mean an entirely new roof is in your future. When possible we will always advise repairs over a full replacement, so long as it’s the most feasible, sustainable, and prudent option. Contact us if you think your roof needs to be replaced. Improve the Appearance of Your Commercial Space — Not only are roofs essential to the functionality of your building, but they are also influential to its appearance and the larger impression your business makes on the community. A clean, quality roof that matches your surrounding area communicates your standards—which, by extension, is a reflection of your business and services. Lower Heating and Cooling Costs – Not only does your roof protect you and your business from the elements, but it also has a profound effect on your heating and cooling costs. With a freshly replaced—and sometimes even repaired—roof your can better control the temperature, creating a more comfortable environment for you, your employees, customers, and guests. In some cases, federal tax credits are given for energy-certified roofs, which can put even more money back into your pocket. Eliminate Future Costs – By nipping little problems at the bud or investing in a new roof, you get the peace of mind of knowing that your roof is built to last—of course, so long as you have it regularly maintained. If your commercial roof needs repaired or replaced, contact Tim Leeper Roofing. We are proud Tennessee roofing contractors based in the Nashville area. Our goal is to support all our community’s business owners and ensure that they have a sustainable roof that will last and help their business grow.